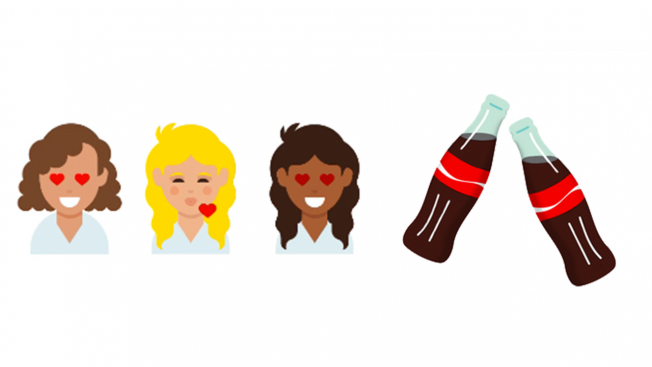 Twitter is asking its biggest advertisers to speak emoji—for $1 million. Since October, Twitter has designed 17 custom emojis—three of which launch this week for Super Bowl campaigns with Pepsi and Anheuser-Busch. Multiple sources confirmed to Adweek a "seven-figure" price for the branded icons, saying that the custom emojis are reserved for Twitter's biggest advertisers, including Coke, Starbucks, Spotify and Dove. Such brands' million-dollar deals entail packages, per sources, that involve the custom emoji with different combinations of the following: Promoted Trends (which normally cost $200,000), Promoted Moments and Promoted Tweets. Instead of running a $5 million Super Bowl TV ad, "some of our clients have been talking about custom emojis on Twitter—this kind of investment could yield five custom, completely bespoke emojis on the Twitter platform," said Jesse Cahill, head of planning for North America at Essence. "Whether it's a branded keyboard or the [Twitter] emoji, we look at those things," he continued. "But for the most part, we think about building brands and what is the most effective and efficient thing. When you think about Super Bowl advertising, it tends to be around brand awareness and perception." Super Bowl advertiser Anheuser-Busch has created two separate Twitter emojis—one for Bud Light and the other for Budweiser—that launch today. Bud Light's Twitter blitz supports "The Bud Light Party" campaign with Amy Schumer and Seth Rogen. "We will be the only alcohol, wine or spirit brand to have custom emojis that will launch [for] Super Bowl when our spots release," said Azania Andrews, senior director of digital connections at Anheuser-Busch InBev. "We know that custom emojis are a relatively new addition to Twitter, and we're really excited to bring that to consumers and help us spread the word." On Sunday, Pepsi will run a Promoted Moment during the Super Bowl in conjunction with a custom emoji of music notes floating out of a can of soda that automatically pop up whenever someone tweets #PepsiHalftime. The effort is part of PepsiCo's strategy to put 40 percent of its Super Bowl campaign toward digital. And when Starbucks aimed to spread holiday cheer with its annual Red Cup campaign, the coffee chain launched a custom emoji and bought a Promoted Moment that pulled coffee-related content together. Combining branded emojis with big ad buys could be one way for Twitter to show brands the power of the platform in terms of visuals and real-time conversations. In addition to the sponsored emojis, Twitter has also designed icons for big cultural events like the 2016 Election, the Chinese New Year and Star Wars that are sure to be buzzy conversations on social media. Still, it's not clear whether or not the expensive emojis can turn around Twitter's ongoing woes. Last week, the social net lost a few top executives, and its stock price recently took a massive fall.